I visited John the other day. A visit was way overdue for two reasons. The first because the kitchen scraps I save for his compost pile were attracting flies and other vermin. The second because too much time had passed since my last visit. I was having withdrawals–the shakes and everything. John and Kathy were out in the yard when I walked up the driveway, weighted down by two buckets of smelly food waste. After John dumped what he considers smelly, nutritious goodness into the pile, he took me on a tour of the garden. So many things happen in a garden over the course of two weeks! Astonishing! The zucchini looked like a miniature rain forest, the corn was coming up, and the blueberry bushes I helped plant were bearing fruit! I am such a gardenerd (thanks to my friend Nicole for that moniker). 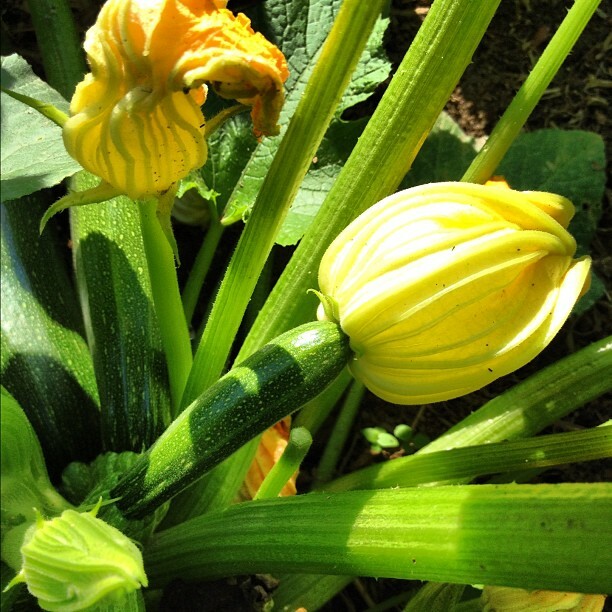 I’m embarrassed to say I didn’t know how zucchini grew, so I was amazed when I saw those large jungle-like leaves and green squash emerging from a pretty yellow flower. 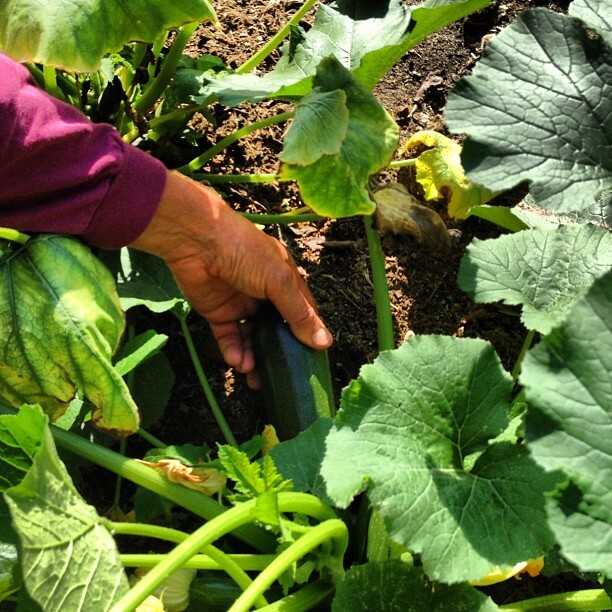 John showed me how to twist the zucchini gently to harvest it. Walking the perimeter of the garden, I noticed the peppers getting taller. I only watered them two Saturdays ago with John’s special and nutritious seaweed water. I’d like to take all the some credit for their growth. We made our way over to the row of blueberry bushes. 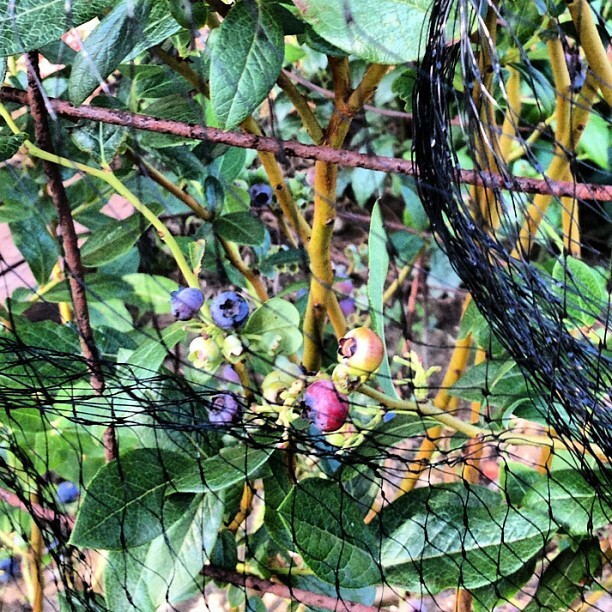 John showed me the half pint of blueberries already picked; they were sweet and plump. The nets he threw over them to prevent the birds from enjoying their juicy goodness were working. 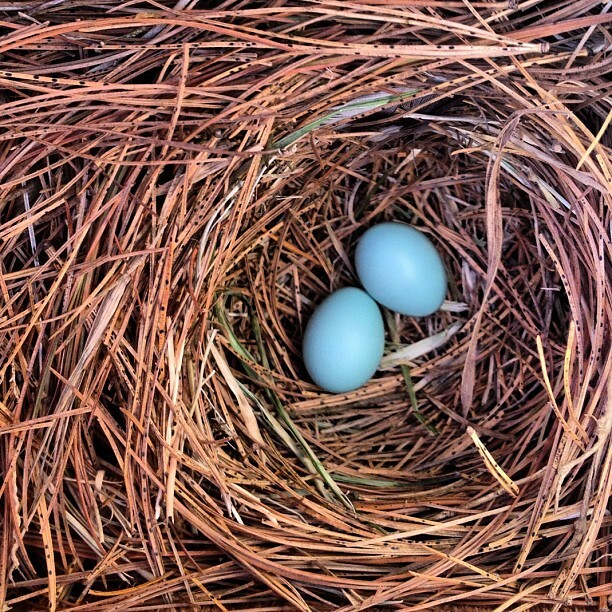 Speaking of birds, remember the lovely blue eggs in the blue bird house? Well, after two tries, the blue bird couple was able to keep some eggs from the sparrows (the sparrows invaded regularly to toss the eggs onto the ground). And they hatched! John lifted the lid of the bird house while I climbed up to take a closer look. 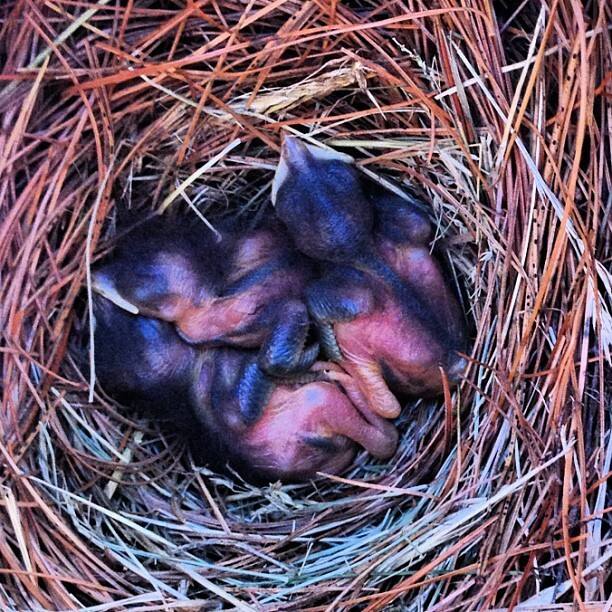 Huddled together in a mass of beaks and fluffy black down were at least three baby birds. I checked out your post. Looks amazing! I never would have thought soup and zucchini flowers would be a good combination. I always see them stuffed with cheese, dipped in batter, and fried. Interesting twist and I loved your post! those baby birds are so precious! They really are. So tiny and fragile. Thanks for stopping by! The baby birds are adorable! Such pretty photos, I love the one with the blue eggs! And also- I feel famous, just sayin. Hi John! So sorry I missed you Friday. I called but then got caught up in helping Joe with some stuff at church and didn’t get out of there until 5. I’m excited about planting green beans! And I heard you have a snake story to share with me! Ugh! I’m late to the garden party though, so I’ll have to play catch up on who John is and this amazing sounding garden. Actually, I need to get Peppermeister over here following, too! He would be all about this – the compost pile, everything! I know, gardenerd is the BEST! 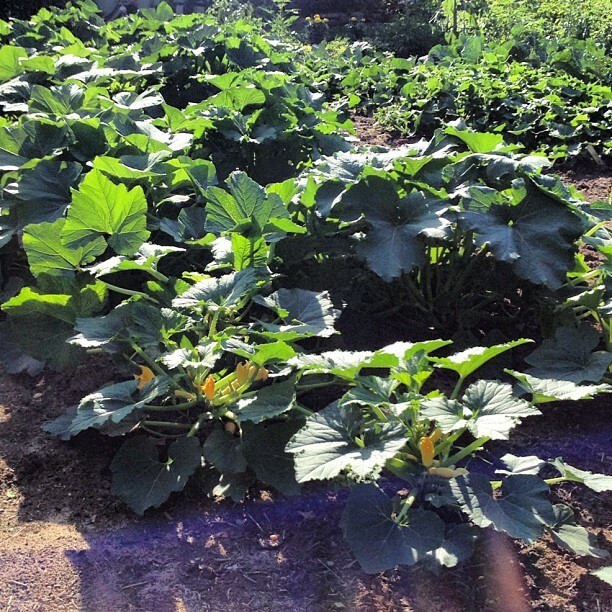 John is an amazing gardenerd with 1 acre of garden in his backyard. I’ve helped him plant tomatoes, corn, potatoes, strawberries, and blueberry bushes. Peppermeister likes to compost? How gardenerdy!